Erm, haven't really been on here very much of late. Which is very remiss of me, as 2012 has actually been my best year ever on patch (so far). With a whopping 149 species in the bag (so far), it is unlikely that I will reach these giddy heights again for some time. Although, that's the beauty of patch birding - you just never know what will turn up! So, what were the highlights of 2012 for Galley then? The autumn was pretty good but not amayzing - with a haul of two yellow-browed warblers, red-breasted flycatcher and richard's pipit all on patch. Which was nice! And it was the best spring I've ever had here, by some distance, despite certain ill-researched literature proclaiming that it is never done in spring! The fall on the 1st of May was of a scale I hadn't experienced at Galley before (although still small beer compared to UK east coast falls), but 200 willow warblers, 150 wheatears, 40 blackcaps, 20 sedge warblers and 10 whitethroats, 4 grasshopper warblers, 3 whinchats, 3 cuckoos, 2 redstarts, 2 lesser whitethroats, reed warbler, tree pipit and short-eared owl is not to be sneezed at!! My best moment of the day was walking a hedge with willow warblers flitting everywhere when suddenly, bam! a garden warbler jumped out in front of me! Patch Tick! Patch Bogey nailed! In a day of big winds, it was the showiest bird I saw, which was just as well as its taken me 9 years to get one on patch! Ridiculous! The seawatching in August was really good too! Massive numbers of Cory's Shearwaters were great to see, plus my fourth fea's petrel here, but best of all was the adult long-tailed skua late one August evening - another long-awaited patch tick and much appreciated! 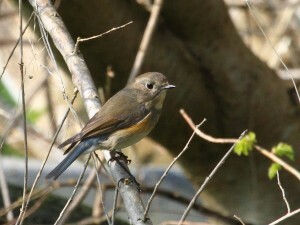 However, the run away winning moment was seeing the female red-flanked bluetail at Shite Lane on 26th March - what a fantastic bird and all the better for being on patch - amayzing! Wowzers! What will 2013 bring? Stay tuned to find out!